Where does high intelligence come from? Some researchers believe that intelligence is a trait inherited from a person’s parents. Scientists who research this topic typically use twin studies to determine the heritability of intelligence. The Minnesota Study of Twins Reared Apart is one of the most well-known twin studies. 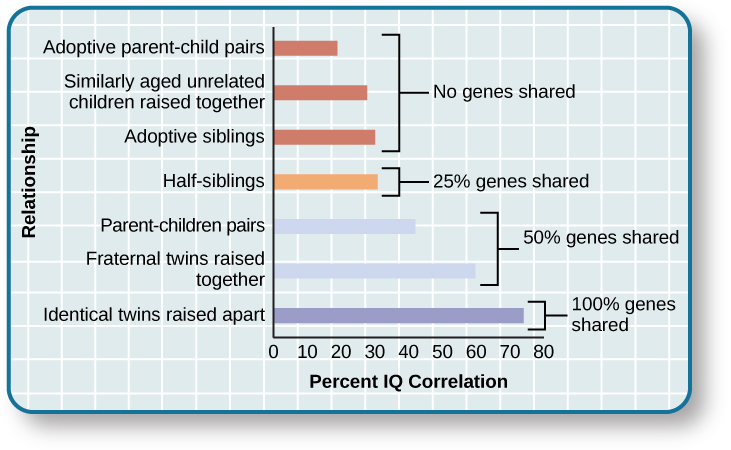 In this investigation, researchers found that identical twins raised together and identical twins raised apart exhibit a higher correlation between their IQ scores than siblings or fraternal twins raised together (Bouchard, Lykken, McGue, Segal, & Tellegen, 1990). The findings from this study reveal a genetic component to intelligence ([link]). At the same time, other psychologists believe that intelligence is shaped by a child’s developmental environment. If parents were to provide their children with intellectual stimuli from before they are born, it is likely that they would absorb the benefits of that stimulation, and it would be reflected in intelligence levels. Dyslexia is the most common learning disability in children. An individual with dyslexia exhibits an inability to correctly process letters. The neurological mechanism for sound processing does not work properly in someone with dyslexia. As a result, dyslexic children may not understand sound-letter correspondence. A child with dyslexia may mix up letters within words and sentences—letter reversals, such as those shown in [link], are a hallmark of this learning disability—or skip whole words while reading. A dyslexic child may have difficulty spelling words correctly while writing. Because of the disordered way that the brain processes letters and sound, learning to read is a frustrating experience. Some dyslexic individuals cope by memorizing the shapes of most words, but they never actually learn to read (Berninger, 2008). Genetics and environment affect intelligence and the challenges of certain learning disabilities. The intelligence levels of all individuals seem to benefit from rich stimulation in their early environments. Highly intelligent individuals, however, may have a built-in resiliency that allows them to overcome difficult obstacles in their upbringing. Learning disabilities can cause major challenges for children who are learning to read and write. Unlike developmental disabilities, learning disabilities are strictly neurological in nature and are not related to intelligence levels. Students with dyslexia, for example, may have extreme difficulty learning to read, but their intelligence levels are typically average or above average. Where does high intelligence come from? Arthur Jensen believed that ________. Poverty always affects whether individuals are able to reach their full intellectual potential. An individual’s intelligence is determined solely by the intelligence levels of his siblings. There are many factors working together to influence an individual’s intelligence level. What evidence exists for a genetic component to an individual’s IQ? Twin studies are one strong indication that IQ has a genetic component. Another indication is anecdotal evidence in the form of stories about highly intelligent individuals who come from difficult backgrounds yet still become highly successful adults. Describe the relationship between learning disabilities and intellectual disabilities to intelligence. Learning disabilities are specific neurological problems within the brain and are separate from intelligence. Intellectual disabilities are pervasive and related to intelligence. Do you believe your level of intelligence was improved because of the stimuli in your childhood environment? Why or why not? The Source of Intelligence by OpenStaxCollege is licensed under a Creative Commons Attribution 4.0 International License, except where otherwise noted.